Nobody would deny that cultural heritage pervades every layer of our societies and fundamentally defines how we live our lives on a daily basis. Yet, few would be able to provide even a vague – let alone comprehensive – description of just what cultural heritage really is. Although there is no universally accepted definition, according to the United Nations cultural heritage is “the legacy of physical artefacts and intangible attributes of a group or society that are inherited from past generations, maintained in the present and bestowed for the benefit of future generations”. Put simply, cultural heritage is cross-border in scope and supranational in nature, while embracing everything from customs, practices, places, objects, artistic expressions and values to natural or built environment and oral history. Preserving our cultural heritage stems from the natural thirst to value and care for things, objects or landscapes that we collectively enjoy as a group of people. That said, it is important to underline that Europe has always been at the forefront of cultural preservation, which is an indispensable motor for economic growth. Am I jumping fast to conclusions? Let me explain. The fact that Europe has long been the world’s number one tourist destination is largely due to our successful efforts to preserve our cultural heritage more effectively than others. In 2016 alone, Europe registered more than 615 million international arrivals, a number that, according to projections, will in the foreseeable future rise to one billion. This is how tourism became the third largest economic sector in Europe after construction and trade, generating about 10 per cent of the EU’s annual GDP. Needless to say that such an influx of tourists fuels economic growth even in the most remote parts of Europe, favouring SMEs and providing for the livelihood of more than 13 million people – many of whom are below the age of 30 – whose only opportunity to avoid sliding into the dark abyss of youth unemployment is finding a job in the tourism sector. Preserving our cultural heritage is one of the best indirect tools at our disposal to maintain economic development and create jobs at the same time. Beyond its obviously advantageous – however indirect – effects on the economy, cultural heritage is perhaps the most prominent facilitator of social cohesion across European societies. If I may, here is a boring commonplace: we are living challenging times. Destructive populism is omnipresent, extremist ideologies are alive and kicking, and Europe is still at the centre of the greatest humanitarian crisis witnessed since the Second World War. As overstated and banal this might sound, if we fail to find the remedy to these pressing issues we risk the emergence of irreversible social disintegration trends in the imminent future. But there is one thing that usually all societies share: a form of collective identity, an abstract sense of belonging that we might as well call cultural heritage. One could argue it is the glue that keeps communities united even during the most critical times. Europe is undoubtedly in possession of such shared common identity and the sheer existence of the EU is the prime example for it – even if all too often we take its achievements for granted. Cherishing our common cultural heritage, therefore, is more than a noble mission: it is our duty. 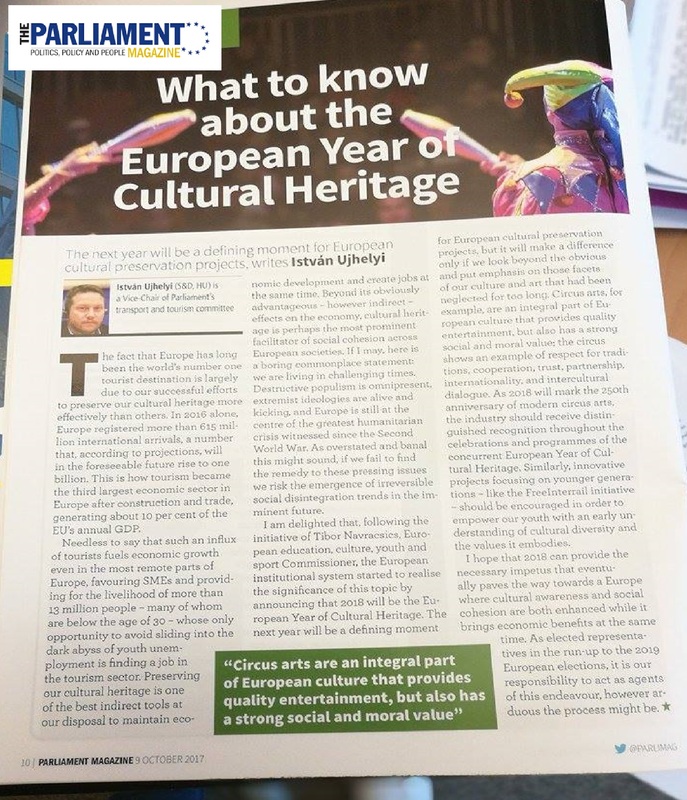 I am delighted that, following the initiative of Tibor Navracsics, European education, culture, youth and sport Commissioner, the European institutional system started to realise the significance of this topic by announcing that 2018 will be the European Year of Cultural Heritage. The next year will be a defining moment for European cultural preservation projects, but it will make a difference only if we look beyond the obvious and put emphasis on those facets of our culture and art that had been neglected for too long. Circus arts, for example, are an integral part of European culture that provides quality entertainment, but also has a strong social and moral value; the circus shows an example of respect for traditions, cooperation, trust, partnership, internationality, and intercultural dialogue. As 2018 will mark the 250th anniversary of modern circus arts, the industry should receive distinguished recognition throughout the celebrations and programmes of the concurrent European Year of Cultural Heritage. Similarly, innovative projects focusing on younger generations – like the FreeInterrail initiative – should be encouraged in order to empower our youth with an early understanding of cultural diversity and the values it embodies. 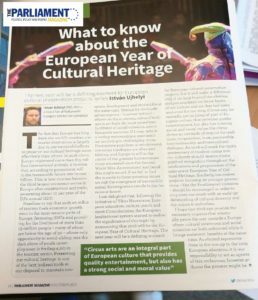 I am concluding this article with the hope that 2018 can provide the necessary impetus that eventually paves the way towards a Europe where cultural awareness and social cohesion are both enhanced while it brings economic benefits at the same time. As elected representatives in the run-up to the 2019 European elections, it is our responsibility to act as agents of this endeavour, however arduous the process might be.